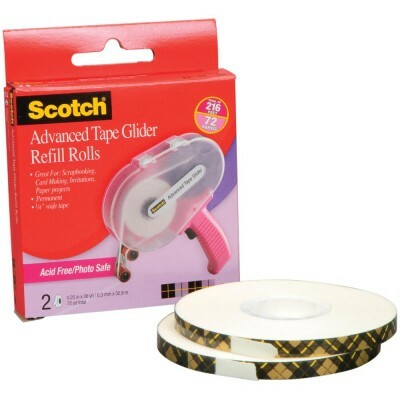 3M-Advanced Tape Glider Refill Rolls. This package contains two 1/4in by 36yd rolls of permanent; acid-free tape. 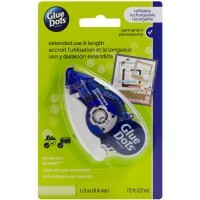 Great for scrapbooking, card making; invitations and other paper crafts. Photo Safe. For use with the Pink Advanced Tape Glider dispenser only (sold separately). 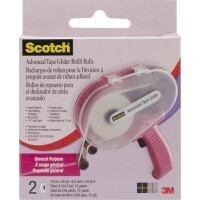 3M-Advanced Tape Glider Refill Rolls. 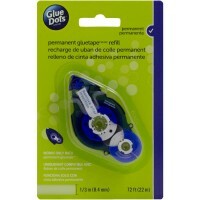 This package contains two 1/4in by 36yd rolls of permanent tap..
An applicator of acid-free permanent tape glue measuring 8.4 mm x 22 m. Great for scra..
An refill for the applicator of acid-free permanent tape glue sold separately Measures 8.4 m..